The Train of Many Colors will celebrate the Mets’ NLDS appearance this weekend. The Mets don’t make the NLCS too often these days, and the MTA is pulling out the stops to celebrate. On both Saturday and Sunday this weekend, the 11-car Train of Many Colors will run from 34th St.-Hudson Yards to Willets Point-Mets via the 7 line. If last week’s 4 train ride to the Bronx is any indication, the 7’s own Nostalgia Train will be packed full with Mets and rail fans alike. Unlike the 4, this one ain’t running non-stop. The train will make express stops along the 7 en route to Citi Field, and you can catch it at 6:30 p.m. each night from the newest subway station in the system. That will be quite a sight. On another note, this weekend is Open House New York, and it’s also the last chance for New Yorkers to check out the old TWA Flight Center in front of JetBlue’s Terminal 5 at JFK Airport before it turns into a hotel. It’s open from 11-3 p.m. on Sunday, and no reservations are required. I’ve seen it twice, and I can’t recommend the trip enough. Check it all out right here on OHNY’s website. Despite the ongoing drama with the 7 line extension — the MTA now anticipates opening the 34th St. station in September or October, 21 or 22 months late — the agency continues to push the party line that the Second Ave. Subway will open by the end of December of 2016. 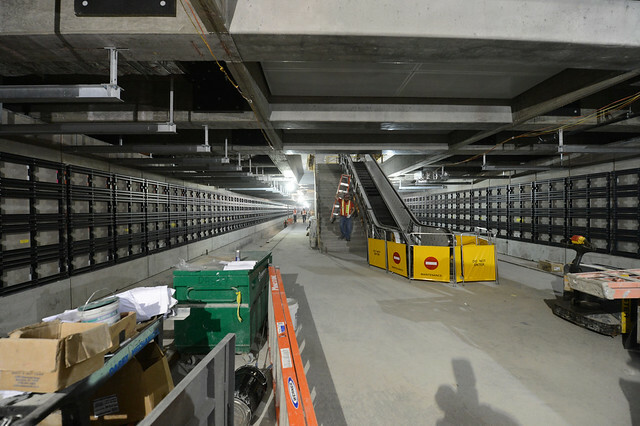 A recent media tour of the construction site revealed significant progress, and the MTA says the project is 82.3% completed. Still, Upper East Side residents I’ve spoken with are skeptical as the work has been marked by constant missed deadlines and broken promises. Meanwhile, across the East River in Queens, Astoria residents are beginning to take notice of the looming completion of Phase 1 of this project, and they’re worried. When the MTA first unveiled plans for the Second Ave. Subway, it was billed as a northward extension of the Q train from 57th St. and 7th Ave. to 96th St. and 2nd Ave. via preexisting tunnel to 63rd St. and new tunnel underneath 2nd Ave. This was 11 years ago when the W split the Queens load with the N train, and extending the Q north would have no affect on service to and from Astoria. In diverting the Q line to the East Side, NYC Transit has not decided if the N can handle riders in Astoria “or if there will need to be trains added,” according to an email obtained by the Daily News. The email was sent to at least two riders who inquired to the MTA about Q service in Queens by Joseph O’Donnell, outreach director for the megaproject. Sen. Michael Gianaris of Astoria said that while the MTA’s assurances sound good, he wants to make sure capacity on the Astoria train lines is maintained. But given the crowds of waiting commuters he sees from his district office, “what they really should be doing is increasing service,” he said. As Rivoli and Sommerfeldt’s person-on-the-street interviewees note in the article, a service cut for Astoria seems ludicrous, and the MTA has maintained since eliminating the W in 2010 that the Second Ave. Subway opening would not lead to less service for Astoria. Still, I can see why some people in Queens may be unsettled by the MTA’s less-than-comforting remarks. At some point soon, the MTA should announce that some version of the W will return with part-time service into Astoria, and the MTA should consider restoring N express service in Manhattan during peak hours as well. For now, we don’t know what the service patterns will be, but in less than a year and a half we will. It should bring comfort to Queens even if the question remains unsettled for now. When I published my postmortems this week on the decision to halt subway service amidst the threat of snow and on Gov. Andrew Cuomo’s LaGuardia AirTrain, I didn’t think I’d be revisiting those topics any time soon. I knew they would both be in the news, but I thought we could let them rest. I was wrong. I’ll start with the snow plan. MTA head Tom Prendergast journeyed to Albany on Thursday to discuss the state of the MTA’s budget. He was there to lobby for the capital plan, but the talk turned to the snow. Since Prendergast is in the position — as we all are — of answer to his boss, he did his best yet again to defend the MTA’s reaction, but it’s been clear that Prendergast is out there as much to protect Cuomo as anything else. At one point during the State Senate hearings, Prendergast discussed the reasons for the closure and decided to argue for public safety. “If people were inconvenienced,” he said, “that’s far better than somebody dying.” Of course, this ignores 110 years of New York City history in which no one has ever died in a snow storm walking to or from the subway, and it is in fact, as I’ve said, safer to keep trains running in a storm than shutting them down for the simple fact that some people will have to travel and should be accorded the respect to make the decision to go out in bad weather conditions. But that’s an argument I’ve exhausted. I want to instead talk about the MTA’s plans. I had the chance to read the MTA’s 2014-2015 Winter Operations Plan. It contemplates running service in all kinds of weather from cold temperates (Plan I) to a declared snow emergency (Plan V). This is a 360-page document designed to maintain subway service through inclimate weather while working to ensure that no one is stranded. This wasn’t some fly-by-night plan, and the idea, as some have put forth, that the public couldn’t handle on-the-fly service changes betrays the daily reality of service changes. It is, frankly, insulting to the public. With proper communication, people can get around relatively safely, and service changes are less confusion than stranding people miles from home. Ultimately, the MTA had a plan, and Cuomo made them deviate. We should understand why, and the explanation, which may very well be a political one, should be thorough. Early on Thursday, the Daily News reported that the MTA may explore running trains in snowstorms. It’s a funny way to put it because the MTA already has a plan to run trains through serious snow storms. Prendergast and Cuomo could certainly reconsider the plan and implement a Plan VI shutdown that’s a bit more thought-out than Monday’s decision. Ultimately, they should remember though, as Glynnis MacNicol wrote, not everyone has the choice to stay home no matter how bad the weather gets. At the same public hearing up in Albany, Prendergast got to talking about the Governor’s plan for the LaGuardia AirTrain, and, oops!, it might cost more than $450 million. Prendergast mentioned under questioning that the $450 million was at the low end of a cost range, and that the upper bounds of the project’s budget is closer to $1 billion. It made little sense at $450 million; it makes no sense at $1 billion. And does anyone believe the MTA, the Port Authority or whichever other entity the State of New York tabs to build this thing would deliver it at under half a billion dollars? I don’t. For more on the Albany hearing and Prendergast’s answers on the AirTrain costs, check out Dana Rubinstein and Jimmy Vielkind’s coverage at Capital New York. The MTA is trying not to come across as blind-sided by Cuomo’s proposal, but it seems clear that they were. Gov. Cuomo announced a Laguardia Airtrain via Willets Point and the Grand Central Parkway. After months of saying very little of anything while campaigning for a second term and hardly anything about transit for four years while governing, Andrew Cuomo stunned New Yorkers by announcing plans to build an AirTrain from the 7 train and LIRR station at Willets Point to Laguardia Airport. Cuomo, who has made modernizing New York’s struggling airports, said that the rail connection will cost $450 million and could be up and running within five years of the start of construction. The Laguardia AirTrain, Cuomo said, will be constructed by the MTA and Port Authority, similar to the JFK Airtrain, and the proposed routing is designed to avoid any NIMBY complaints. The proposal calls for a terminal at Willets Point above the Corona Yards in between the 7 line stop and LIRR station with a routing above the Grand Central Parkway to Laguardia Airport, under two miles away. “You can’t get to Laguardia by train, and that really is inexcusable,” the governor said. So does it work? Let’s drill down. In a vacuum, a rail connection to Laguardia with political support, political capital and a political champion behind it is a good idea. The governor, who is, despite his flaws, a strong executive in New York, is talking about improving the way we travel to the airport, and he has a vision that is, compared with other New York City transit projects, affordable and practical. It doesn’t involve construction through any neighborhoods replete with NIMBY opposition and solves an immediate problem by improving access to Laguardia in a way that isn’t as stigmatized as bus service is. In broad strokes, a Laguardia AirTrain is a badly-needed service that should have been built years ago. That said, Cuomo’s proposal is something of a mess from a transit planning perspective. By avoiding any battle with NIMBYs — except perhaps with those who live above the Grand Central Parkway with views of the Long Island Sound — Cuomo has essentially picked the worst of the possible Laguardia rail connection routings, and we don’t know why. As I mentioned, Cuomo didn’t discuss how other alternatives were eliminated or how he settled upon his proposed alignment. The real issue is travel time. The 7 train from Times Square to Willets Point is a 25-minute express ride and a 30-minute local ride. AirTrain passengers would then have to switch to an AirTrain and backtrack to reach the airport. To make this work, the MTA would have to consider permanent super-express service to Willets Point during off-peak hours, and I’m afraid consider the peak-hour effect on already-crowded 7 trains. At least the nearby LIRR station can alleviate some of the pressure, but a trip that takes a good 45 minutes from Midtown can’t compete with the Q70 from Jackson Heights, a shuttle bus or even a taxi. Now, in the past, as we know, NIMBYs torpedoed a Giuliani plan to send the N to Laguardia. You can read the original engineering report and my recent analysis of the old plan. That’s probably the ideal alignment in terms of speed as it is the most direct connection to Manhattan and major destination points from Laguardia. The second best choice would have involved staging an AirTrain station near Jackson Heights and providing service from the 7/E/F/M/R station via the BQE and Grand Central to the airport. Instead, we have a Willets Point-based plan, and we don’t eve know why. This isn’t something we should accept simply because a politician has proposed spending money on an AirTrain. The money, of course, is another major issue. The MTA is in dire need of someone to address a $15 billion capital funding gap in its current five-year plan. They need to spend $32 billion but can only generate around $17 billion. Meanwhile, this $32 billion doesn’t include the capital costs for a new airport rail connection. Now, the agency is scrambling to update its documents, but the money for the badly needed parts of the plan — signal upgrades, Phase 2 of the Second Ave. Subway — still isn’t there. The other issue is the cost. It’s optimistic to think that the MTA and Port Authority can build a rail extension on time for around $300 million a mile, and although the JFK AirTrain was on time and on budget, nothing else of this magnitude has been. I can run through the litany of problems that have plagued the 7 line, the Fulton St. Transit Center, the PATH Hub, East Side Access, and the Second Ave. Subway, but we know this story well: Nothing comes in on time or on budget, and cost projections often do not align with reality. Without a better understanding of the sources of Cuomo’s $450 million price tag, we can’t adequate assess this project’s chances either. Still, as I mentioned, the MTA’s current capital proposal should take priority. Right now, I have no idea where this goes. When Bloomberg announced the Secaucus plan for the 7 train late in his third term without the support of the MTA, Albany or New Jersey, it was obvious this plan would go nowhere. But Cuomo is at the start of this second term and has banked a lot of political capital on dealing with New York’s airports. He has the weight, the pull and the financial resources at his disposal to get this project off the table. It might just happen, and it just arrived out of left field. Still, I have serious reservations about the way this came about. It’s not a great alignment, and it leaves commuters on a slow and crowded train. It’s a connection, but it’s not a direct one. It doesn’t help improve access to Laguardia for airport workers, and it shifts economic resources from other projects and proposals that should be a priority. Still, it’s heartening to see Cuomo paying attention to rail. Is there time to improve this idea or are we doomed to another airport connection that’s only just good enough? When I first wrote about the plans to turn the LIRR’s old Rockaway Beach Branch back in 2011, I never imagined it would become a major rift issues for otherwise-civil transit advocates. Of course, considering how I framed that first post — as a referendum on the finality of a rail trail vs. rail reactivation — I should have seen this coming. Now groups that usually fight for better transit, pedestrian and biking infrastructure are going at each other over a $120 million plan to build a High Line equivalent deep in the heart of Queens. All I want is some intellectual honesty. As I mentioned in early November, I don’t know if the rail line is the right answer, and I don’t know if a park is the right answer. I find it hard to believe, based on geography, demographics and overall transit needs, that a park would trump rail all things being equal, but while we’ve gotten a park study funded by the pro-parks side, the pro-rail study was more of a school project sponsored, nobly so, by Assemblyman Phil Goldfeder. The numbers out of that study proclaimed 500,000 daily riders — almost too exorbitant to be believed — and no independent engineering group has been commissioned to give equal assessment to either option. That’s what I want. Of the two tantalizing possibilities — rail or trail — trail now has the upper hand. A half-million-dollar study, released in October, resoundingly affirms the foregone conclusion of the national conservation group that commissioned it, the Trust for Public Land. It found that the QueensWay would be a boon to the borough, transforming a humdrum stretch of residential-commercial-industrial-whatever with the sylvan graciousness that the High Line brought to the West Side of Manhattan, but on a far bigger scale. It would open a walk-and-bike gateway to another big park, Forest Park, that is now dangerously hemmed in by roadways. The study tallied other benefits: fewer traffic fatalities, better flood control, cleaner air, fitter New Yorkers and new commercial and cultural amenities. As new parks go, it would be relatively cheap — about $120 million. The rail idea has no counterpart study, but it has its advocates, like Assemblyman Phillip Goldfeder, whose district includes the Rockaways. 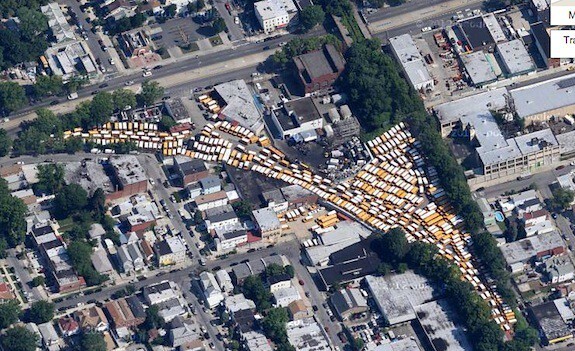 They say it’s foolish to give up an existing right of way in a part of the borough so starved for mass transit. They have a point, but they may be understating the difficulty of reviving those rails for trains. Of the QueensWay’s 47 acres, seven are parkland. If the city, which owns the land, was to return it to the Metropolitan Transportation Authority for transit, it would have to find replacement parkland somewhere else. Then there is the question of when the M.T.A. would get to this capital project, which would be one of many on its overflowing, underfunded to-do list. The likeliest answer is never. The M.T.A.’s capital plan is only half-funded; the agency is strapped by debt and is hard-pressed to protect the infrastructure it has. First, there is the use of the adjective “less-flashy” as a way to describe rail. Immediately, The Times has relegated something they admit will improve commutes for thousands as less flashy than a park that won’t even be open 24 hours a day. If avoiding “creeping along congested boulevards” is considered less flashy that some fancy renderings, count me in. Next comes my favorite line in any Times editorial: “A half-million-dollar study, released in October, resoundingly affirms the foregone conclusion of the national conservation group that commissioned it.” Read that again and soak in its absurdity. The basis for The Times’ pro-park argument is a biased study that shockingly affirmed the views of the biased group that paid half a million New York taxpayer dollars for it. If anything, that should be a reason to doubt the pro-QueensWay rhetoric, not line up in support of it. Next the price tag: Somehow, a $120 million new park is cheap. The most expensive linear park in New York City cost $150 million and was funded in large part through private donations. No one has even bothered to discuss how the QueensWay project would get off the ground with the support of the same group of wealthy patrons who, for better or worse, rammed the High Line through Chelsea. No matter what, $120 million for an area rife with parks it can’t adequately maintain today is not cheap, and the idea of using value capture that helped fund the Hudson River or Brooklyn Bridge Parks is as controversial to the neighborhood NIMBYs as rail reactivation is. Finally, we arrive at the criticism of the MTA. When will the MTA get to it, The Times asks. Why aren’t they interested, say QueensWay proponents. Of course, in recent history, the city doesn’t wait for the MTA to do something; rather, interested parties deliver the dollars, and the MTA gets to work. Chuck Schumer got money for 2nd Ave., and Mayor Bloomberg funded the 7 line. The 9/11 recovery fund built the Fulton St. Transit Center, and George Pataki delivered dollars for East Side Access. Imagine if the QueensWay proponents had lined up political and economic support for rail reactivation instead of the park. It would be a much more likely outcome. Ultimately, The Times betrays itself in its conclusion when it notes “the rare chance to plug a spectacular park into a densely built streetscape that really needs it.” A densely built streetscape needs transit not a park “plugged” through it. All I want is a fair study by an independent group that gives equal air time to the park and the rail. That seems too much to ask once The Times gets seduced by that flashy park. Ed. Note: I’ve updated this post with a rendering from The Queensway’s presentation. The use of an ENYA design was misleading and distracting from the content of this post.